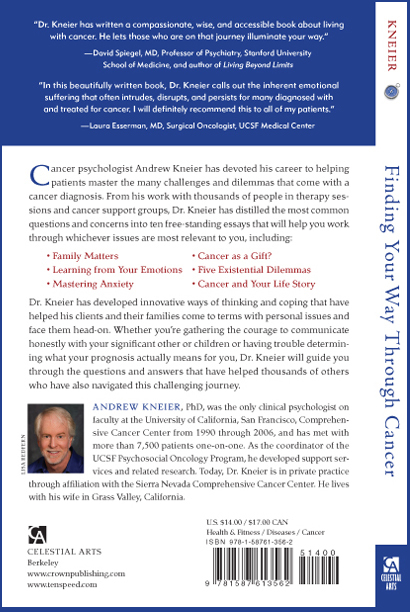 Cancer psychologist Andrew Kneier has devoted his career to helping patients master the many challenges and dilemmas that come with cancer. He knows that people with cancer are thrust into an unpredictable and disquieting world, and that each person must find their own way. This book is dedicated to that goal. 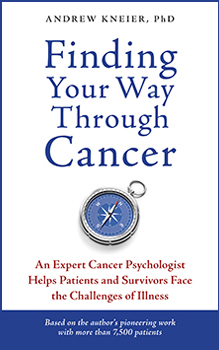 "In this beautifully written book, Dr. Kneier calls out the inherant emotional suffering...for so many who have been diagnosed with and treated for cancer. People will recognize their feelings and reactions in these pages and the wisdom-infused stories will give the permission and tools to cope with the shock...and devastating uncertaintly that can accompany a cancer diagnosis. This book gives voice to those feelings...and not only validates them but helps people triumph over them. These stories teach and help heal the emotional damage brought on by cancer...(and) is a wonderful resource for anyone facing a life-threatening illness. I will definitely recommend it to all my patients"